The Hawke’s Bay Regional Council has ambitious plans to plant up our region in trees. It recently approved $30 million for restoration work and signalled its intention to invest substantially in forestry over the next decade. In the context of the Government’s proposed 1 Billion Trees programme, and with Ngāti Kahungunu simultaneously developing plans to ‘recloak the land’ through their Kahutia Accord project, we’re set to see some big landscape changes. But what does the Council mean by ‘afforestation’? And how will this roll out? 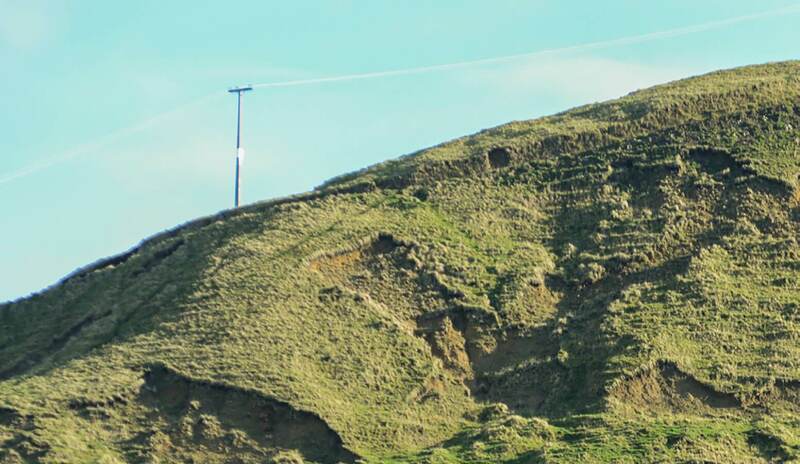 Hawke’s Bay has 276,000 hectares of erosion-prone land, and this is what primarily is driving the Council to reforest it. Ten percent of Hawke’s Bay is in an extreme state (most of the topsoil already lost): steep hill country, cleared for pastoral farming in our colonial past (and with government subsidies in the 1970-80s). Trees, with their web of roots, hold and build soil – there’s a 90% difference in erosion between bare paddocks and forest. Additionally, when heavy rainfall occurs, a third is captured in forest canopies, evaporating before it even gets to the ground. With most of our region deforested, we are losing three million tonnes of soil a year, and in the process silting up our waterways. Not only are we exposed to on-land vulnerability through a legacy of “unwise decisions”, it seems we’re in danger of destroying our coastal fisheries through our current land practices. The United Nations’ Food and Agriculture Organisation estimates the world loses around 1% of its topsoil per annum, a finite resource – but it takes on average 1000 years to produce 3-4cm of topsoil. 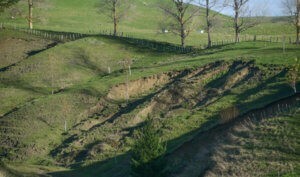 NZ’s East Cape, and further south around Tūtira and the Esk, have some of the highest rates of soil loss on Earth. 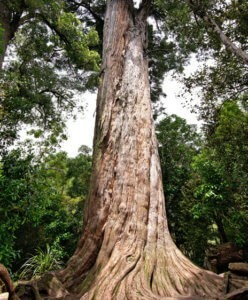 Of New Zealand’s commercial forests, 99.9% are Pinus radiata. It’s no surprise then that when the regional council proposes to invest in forestry that blankets of pine are what first come to mind. Pines were planted extensively for soil-erosion protection under the NZ Forestry Service in the 1940s-70s, a state service that’s recently been resurrected as Te Uru Rākau. But with the emergence of an industry based on their productive commodity value, it’s become apparent, we replaced one set of legacy issues with another. Rural communities can feel isolated and hemmed in by pine monocultures, explains Nathan Heath, HBRC’s acting manager for land management, which are often owned by outside companies, who make little tangible contribution to the community between plant-up and clearfell harvest. What’s left are damaged roads and the nightmare potential of a Tolaga Bay scenario (in which 1 million tonnes of ‘slash’ slew through farmland during a deluge, causing millions of dollars worth of damage) during the so-called ‘window of vulnerability’ – the 6-7 years it takes for new pine seedlings to graft root systems to hold land, stripped of its vegetation, together. With Wairoa’s ‘wall of wood’ heading for the port (11,000 ha of pine forest due for harvest) and questions around how to manage this appropriately, understandably there’s some anxiety. Heath says the Wairoa community is clear it doesn’t want to see a pinus radiata agenda. And while the Council is adamant it’s not pushing for pines and is working hard to investigate alternatives, the perception that they will ‘capitulate’ to the quick-fix lure of pines is the first barrier to overcome. James Palmer says “there will always be a place for pine”, but the Council is looking with more nuance for the right tree in the right place for the right purpose, and will be taking a targeted landscape approach. With National Environmental Standards for Plantation Forestry (NES-PF) in effect since 1 May, there will be more careful planning of establishment forests going forward and a consideration to the future impacts of harvesting – resource consents are required by law, as well as environmental impact assessments. 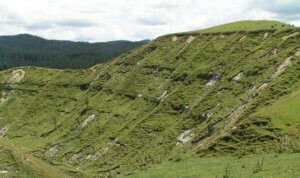 Under the NES-PF, there will be areas of Hawke’s Bay, where short-rotation forests, like pine, are no longer permitted. Palmer notes that some of the large forestry companies have already moved out of areas where the landscape is too steep or eroded, providing instead for native reversion. 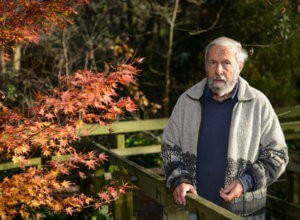 AUT policy researcher David Hall believes New Zealanders have a tendency towards “trinary” compartmentalised thinking when it comes to viewing land-use: native conservation forests vs. exotic commercial forest vs. pastoral agriculture, with each effectively ‘siloed’ in the landscape. It’s a lens that no longer serves as we seek solutions to the consequences of past practice. He’s batting for a transition to more sustainable, climate-aligned forestry, which requires adaptive decision-making, supported by rigorous monitoring and evaluation, alongside an interweave of diverse land-use activities and practices. The Council calls it ‘integrated catchment management’, and it’s a big part of their afforestation strategy. Council has committed $30 million as part of its LTP towards grant-funded restoration work – within reason, “anything that will result in a reduction of erosion from our critical areas,” says Iain Maxwell: revegetation, but also fencing, riparian planting, constructing wetlands for trapping sediment. While HBRC has extensive understanding of soil erosion and water catchment issues through its existing science knowledge and modelling work – where these are likely to occur, and potential solutions – it will need to “pinpoint” this through direct landowner engagement. “Nothing will replace an experienced eye walking the land with the landowner, understanding their aspirations, helping them understand where the problems exist, why they’re a problem and what they can do about it,” says Maxwell. To this end, HBRC has created and resourced 16 new positions. As of 1 July, there will be catchment managers based in Wairoa, Napier and Waipawa, with teams of advisory staff and a significant package of resource, to engage daily with landowners and communities in the field. The aim is to bring diversified systems, and thus resilience, into both farms and vulnerable landscapes, mitigating climate-change risk – the increased weather events and storm intensity projected for the region. HBRC staff will help farmers plan for the future by working alongside to develop comprehensive, farm-tailored environment plans and then “bring resource to make that happen” – either a grant fund, says Maxwell, or “we will work to broker relationships with commercial providers”. Mānuka trials at Tūtira have shown fantastic prospects around high-return yields of high UMF, says Maxwell, while there’s much more potential for silvopasture (deciduous trees integrated into pastureland) – a hugely important tool that’s been long researched over decades. As he sees it, one farm could have blocks of pine trees, regenerating natives and other yield-of-return species, grazed hillfaces with spaced poplar poles, as well as traditional purely grassed paddocks. There’s openness for innovative arrangements, for example, individual farmers might choose to work collectively within a subcatchment to bring about something commercially viable, whether that’s mānuka, tōtara or “something we haven’t thought about yet”. Council is also looking to invest up to $100 million in new forestry, both as part of its investment portfolio and to draw on the “levers” available for subsidising afforestation. It’s investigating a range of commercial forestry options: slow-rotation hardwoods (redwoods, Douglas fir), eucalypts, mānuka, native species for harvest, such as tōtara, as well as radiata. Palmer says there will be a set of trade-offs and considerations as the Council seeks to balance its environmental (carbon sequestration, soil protection) and economic (a fair rate of return) objectives. While central Government has funding mechanisms in place, such as the Hill Country Erosion Fund (which received a “top-up” in June), in the commercial forestry space it’s still a work in progress. HBRC is currently in discussion with the Government about other funding availability – they’d like to see, for instance their dollar of investment matched, if not doubled. HBRC are also in close discussion with Ngāti Kahungunu Iwi Incorporated – which has earmarked 100,000 ha of land and $100 million for planting natives, a percentage of mixed harvestable trees and 500-year plantations – as well as other treaty settlement entities on their investment interests. HBRC chair Rex Graham is particularly keen to pursue the potential for a three-way partnership between Council, Crown and iwi, which would substantially leverage resource, reach and multi-purpose outcomes. Several moving pieces need to line up: 1) land on which to plant, with a good understanding of viable forestry activities; 2) building up and coordinating nursery capacity for plant stock; 3) adequate skilled labour to plant and maintain (There’s a potential synergy touted between horticultural labour and forestry, with seasonal complementarity and the possibility to develop more consistent, year-round work opportunity); 4) infrastructure, such as roading access. There are no processing facilities for eucalypts at present, although trials at HBRC’s Waihapua Farm (south Tūtira) show they grow as quickly as pines and could be an alternative to tannelised posts in the viticulture industry. But without markets it’s hard to calculate ahead the economic return. Which returns us to the question of how we make that economic in the short-term – and the importance of carbon credits. One of HBRC’s stated objectives is for Hawke’s Bay to be NZ’s first carbon-neutral province by 2040, a goal that’s seen as achievable if all our highly erodible land is afforested – with carbon sequestration offsetting emissions. A critical determinate for success, however, will be the price of carbon. If it becomes a more lucrative proposition (prices are rising as market confidence grows), there’s more scope for recompensing the ecosystem services trees provide and thus opportunity to focus on more restoration work and biodiversity and innovative trials of alternate species. New Zealand has significant obligations to meet under the Paris Climate Accord, but has a large carbon deficit looming, both as a result of current harvests (we’re cutting down trees faster than we’re planting) and our lack of progress in reducing emissions in other sectors, including transport and agriculture. 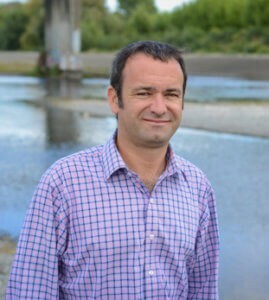 Nathan Heath, who’s transferring to Wairoa to take up the new catchment management role, says to do the right thing is going to take time, careful consideration and working with affected communities. Viable alternatives to current land-use practice will include exploring ways to integrate a much wider spectrum of mixed uses for trees in the landscape (both urban and rural) and rethinking forests and how we manage them. Mixed age continuous canopy forests, mixed species forests, selective logging from new native forests, corridors of biodiversity within plantation designs, shelter belts and innovative nurse crops… these are just some of the ideas tabled. What’s palpable, though, is the sense of excitement at the prospects and potential of taking decisive action – with the convergence of funding, community backing and political will, “the stars have aligned” for change. At the end of the year, there’ll be an opportunity for all parties to influence the path forward through the public consultation process when HBRC officially tables its forestry investment proposition.